We’d love your help. 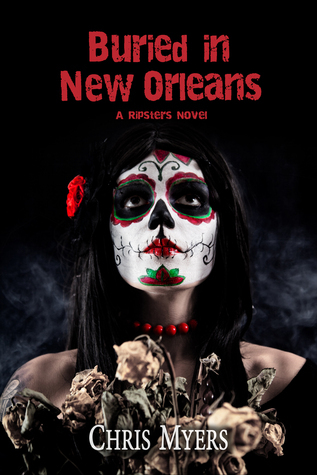 Let us know what’s wrong with this preview of Buried in New Orleans by Chris Myers. Almost a year ago in New Orleans, Drew made a suicide pact with his girlfriend April. Jolie and her ghost hunting partner Brit drag him back to where it happened to find out why he cannot cross over. While they make their way to the F Jolie's best friend Drew has always been special, despite the fact he's dead, but what Jolie uncovers in New Orleans may mean the end of him. To ask other readers questions about Buried in New Orleans, please sign up. Buried in New Orleans starts off with Jolie, Brit, and Drew heading to New Orleans so he can cross over. They search for April, Drew's girlfriend from when he was alive, to get answers as to why he hasn't been able to. They run into Jolie's old ghost hunting gro I received a copy of this book for my stop on the blog tour at Donnie Darko Girl. Buried in New Orleans starts off with Jolie, Brit, and Drew heading to New Orleans so he can cross over. They search for April, Drew's girlfriend from when he was alive, to get answers as to why he hasn't been able to. They run into Jolie's old ghost hunting group NOSH (New Orleans Spirit Hunters), and she's less than thrilled to see them because Drew has been hanging around her for so long. Jolie's kind of been putting off helping him move on, and it's a huge no-no to allow a spirit to hang around. I love these characters and this series! It's an amazing story line which gets better with each book. Each character has his or her strengths and weakness, but they all bring something to the table which makes them such a great team. I truly believe Jolie was born to help spirits. She gets part of her talent through her mother and grandmother, but she also puts her heart into everything she does. Her downfall? Drew, but I can't blame her! Drew has been there for Jolie - helping her get ghost hunting jobs, supporting her on the move to Massachusetts and starting a new school. He's been her only friend until Brit. He's comforted her, and it's totally understandable why she wouldn't want to let all that go. So when the mystery of why he can't cross over is revealed, it's a complete shocker. Never saw it coming! It makes it even more difficult for Jolie to help him because helping him means letting him go. I really empathized with her - I wouldn't want to lose my best friend either. Jolie, Brit and Drew are back for another adventure – this time in the voodoo community of New Orleans, with lots of villains, not least of which is the notoriously wicked slave owner Delphine LaLaurie (she's a ghost here, as opposed to being alive when played by Kathy Bates on “American Horror Story”). I love this series. I crave the next book. Jolie has the good head on her shoulders (which she really has to work to keep there), Brit is the comic relief. And Drew? Well Drew is a lot of things, Jolie, Brit and Drew are back for another adventure – this time in the voodoo community of New Orleans, with lots of villains, not least of which is the notoriously wicked slave owner Delphine LaLaurie (she's a ghost here, as opposed to being alive when played by Kathy Bates on “American Horror Story”). I love this series. I crave the next book. Jolie has the good head on her shoulders (which she really has to work to keep there), Brit is the comic relief. And Drew? Well Drew is a lot of things, none of which I will allude to here because it might ruin surprises. I thought this was the conclusion.....but it looks like there will be more Drew & Jolie! Bring it! This installment of the Ripsters series sees Jolie and Brit travel to one of the most haunted cities in the world, New Orleans. Their aim is to help Drew cross-over by finding the ghost of his ex-girlfriend, whom he made a suicide pact with. As usual, nothing is this simple though, for the protagonists, as they become involved in the battle over who will become the next voodoo queen and restraining the ghost of a psychotic and infamous slave-owner. As in Dead and Missing, Jolie and Brit share the This installment of the Ripsters series sees Jolie and Brit travel to one of the most haunted cities in the world, New Orleans. Their aim is to help Drew cross-over by finding the ghost of his ex-girlfriend, whom he made a suicide pact with. As usual, nothing is this simple though, for the protagonists, as they become involved in the battle over who will become the next voodoo queen and restraining the ghost of a psychotic and infamous slave-owner. As in Dead and Missing, Jolie and Brit share the narration and whilst Jolie is pre-occupied with her thoughts of saying goodbye to Drew, the best moments in the story involve Brit, her pink platform heels, Burberry bag and Grandma’s stain remover! Chris Myers allows us to appreciate that no-matter how different the two young women are, they share a loyal and caring heart. In fact, the most moving episode in the story involves Brit and the ghost of a mutilated slave. This depressing reality contrasts with the voodoo world of Rosella, which Brit and Jolie are inadvertently dragged into. Amidst the danger, magic and talking with spirits, Chris Myers focuses more upon the feelings which have always existed between Drew and Jolie. Being faced with the thought of losing each other forever, forces them to admit their love, but not aloud. Apart from the occasional touch or chaste kiss, neither Drew or Jolie act upon their feelings and I think because of this, we have more belief in their relationship. Buried in New Orleans is packed with humour, mystery, tension and shocking events! This would be ideal for fans of Young Adult books, who like a change from the regular paranormal series’! I hope Chris Myers releases the next book soon. I received this book as an ARC for an honest review. This is the first book by this author. Although this is not the first book in this series, I had no trouble reading this and didn't get lost. This is a great "Nancy drew" type book. Jolie is on her quest to help Drew. Well written and laid out. I will be going back to read the first two. No spoilers for me. Read and enjoy!!! Ripsters is a great series. I read all 3 books at the same time and really enjoy the story line in every book. Great characters with a little bit of everything from romance to mystery, this series is a must read (especially if you enjoy books with ghosts). I look forward to reading the next book in the series to see what happens to Jolie and her ghost hunting friends. Join Jolie on her next ghost hunting mission--solve her ghost mate Drew's mystery before it's too late. Ghostly fun. Join Jolie on her next mission--to solve the mystery of Drew and why he cannot cross over. Oh my god! How could you leave us like this?! There definitely needs to be more to this amazing series! I must find out what happens next! This book took us into the voodoo culture in New Orleans which is really interesting to read about! I couldn't stop laughing at Brit either! I don’t wanna spoil anything so I will just say we learned some SHOCKING information and I’m still trying to grasp it! This book was intense though and loved it! Please please please give us book 4!